While it is free to view, save and distribute PDF documents, editing PDF files using the Adobe Acrobat software is not free. In this post we will be introducing you to some free PDF Editing Tools that you can make use of to edit PDF files, without using the Adobe Acrobat software. Portable Document Format or PDF as it is popularly known, emerged as the leading format for document delivery and distribution, especially after it was made available for free of charge by Adobe Systems in 1993. However, the popularity of PDF is not only due to its free availability. What makes PDF so popular is its ease of use, stability and the ability to function on all platforms, devices, operating systems and software platforms. PDF documents can be opened and viewed on any device, including Windows computers, Mac, Chromebook, iPhone, Android Phone, tablets and e-Readers using the Free Adobe reader. PDF documents take less space and retain their original formatting on any device. A PDF file is just a graphical representation or a snapshot of the text, there is really no text in a PDF file, although it appears so. This makes PDF a preferred format to distribute “read only documents”. Unlike Microsoft Word or Excel files, PDF documents are basically meant to be “read only” files. PDF documents open in the same format across multiple devices and there is no way to edit these files from the screen viewer. 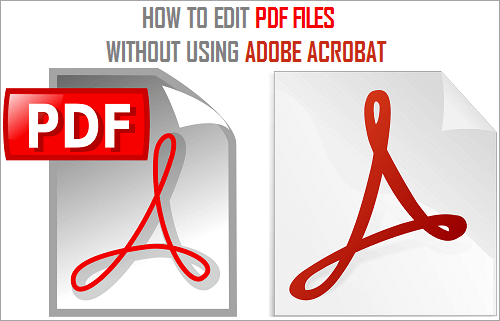 In case required, you can use the Adobe Acrobat Software to edit PDF files. However, unlike its document reader and the PDF file format, the Adobe Acrobat software used for editing PDF files is not available for Free. It is recommended that you buy and own the Adobe Acrobat Software in case you are editing a large number of files. However, for occasional PDF editing needs you can always make use of some free tools that are available on the internet. Sometimes you only need to make minor changes to a PDF document, like hiding dates, numbers, source file location or just to highlight sections of a document. PDFEscape – This is an online PDF editor that lets you hide parts of a PDF file with its whiteout tool. You can also add annotations to the PDF document using arrows, text boxes and other shapes. An easy way to edit PDF files is to convert the PDF file to Microsoft Word or Excel document format. These are some of the Free tools that you can use to convert PDF files to Word format. BCL Research – This Free tool available at pdfonline.com does a fairly good job of converting PDF documents to word, including PDF files with tables, charts, and images. NitroPDF – Converts any PDF document including those with images and tables to Word format. Available at pdftoword.com, NitroPDF gives better results than most available tools but also takes more time. The interface requires you to upload the PDF file to NitroPDF and provide your email address. The file will be emailed back to you after conversion to word, usually within 12 to 24 hours. Once the PDF document is converted to Word you can easily make changes to the file and convert the document back to PDF format, using any PDF writer like CutePDF. You can also use the native feature in Microsoft Office to print the edited document to PDF or save it as a PDF document. Sometimes you may be required to do more advanaced editing like replacing images on a PDF file, without breaking the formatting or flow of the document. PDFXChange – PDF Xchange viewer and editor lets you insert images in a PDF document, precisely on any page or location that you want to. This is not an online tool, You will need to download the PDF Xchange software to your computer in order to use it. Inkscape – Is an Open Source vector graphics editor, with capabilities that are similar to Adobe Illustrator and CorelDraw. Inkscape can also be used to open PDF files, one page at a time, and then you can edit and re-arrange elements on your PDF file. However, you need to be aware that Inkscape is not specifically designed for editing PDF files and is not the most efficient PDF editing tool.